The move comes as the Wall Street Journal reports that Blackberry will lay off 40% of its staff before 2014. Widening the appeal of BBM could be a clever way for the company to reinvent itself, said experts. "Blackberry is having a tough time, sales are down, it is losing market to Windows phones and it needs to do something to stop the rot. This is as good a move as any," said Chris Green, principal technology analyst at Davies Murphy Group Europe. 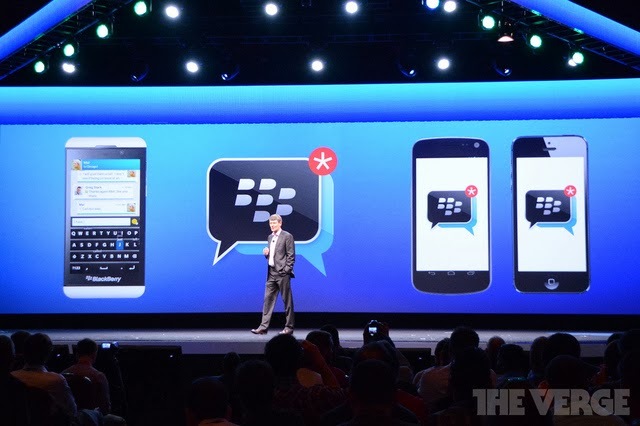 "Offering it across other platforms broadens the appeal of BBM," he added. BBM will be available for Android devices running Ice Cream Sandwich and Jelly Bean while iPhones running iOS 6 or iOS 7 can also download it. It will be available for Android from Saturday and for iOS from Sunday. "With more than a billion Android, iOS and Blackberry smartphones in the market, and no dominant mobile messaging platform this is absolutely the right time to bring BBM to Android and iPhone customers," said Andrew Bocking, vice-president for BBM in a blogpost. BBM has been described as Blackberry's "crown jewels" and the service hit a chord with a mass consumer audience. Offering it to a wider public will not make any money for the company. "It could even cost it money," said Mr Green. "The firm is having to reinvent itself and whether that will be by focusing on software, monetising BBM, licensing its products or joint ventures is not yet clear. At the moment it is throwing everything out there," said Mr Green. 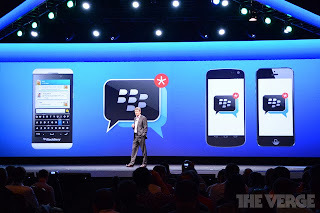 Blackberry chief executive Thorsten Heins revealed the plan at the company's annual developers conference in May. At the time, Mr Heins said that the move was a "statement of confidence" and would allow Blackberry Messenger to "become an independent multi-platform messaging solution". It could prove disruptive to other messaging services such as Skype and Whatsapp.